Prime Minister Narendra Modi’s rapid visit to France on the last leg of his 4-nation tour of Europe shows attempts to put a new energy at the heart of Indo-French ties. Less than three weeks after the inauguration of a new President and less than a week before he faces his first Parliamentary election to cobble together a governing majority for his term is hardly an appropriate time for a visit by the leader of a country that is an important strategic and business partner. This was the scenario facing French President Emmanuel Macron as he prepared to receive Indian Prime Minister Narendra Modi in Paris for the first ever meeting between the two leaders, both of whom have redefined politics in their respective countries and caused a major upheaval amongst their opponents. Yet, unbeknownst to both, a decision by a third leader of a nation that is the most important strategic and business partner, both of France and India, and who has entirely redefined politics and diplomacy, at home and abroad, barely two days before Modi stepped foot in Paris gave a sudden dynamism and urgency to their meeting, which now began to seem as most timely! The sudden, though not entirely unexpected, decision by the United States of America’s (US) President Donald Trump announcing the withdrawal of the US from the COP21 agreement on climate change gave a lot of substance to the Macron-Modi meeting as both France and India, together with China and US, had been at the forefront of an effort to clinch a deal at the Climate Change Summit in Paris in December 2015. A personal chemistry between Modi, the then US President Barack Obama and Macron’s predecessor in Palais Elysees, Francois Hollande, with active support from Chinese President Xi Jinping had made the deal possible. The deal was even more significant for France and India as the two had stitched together an ambitious multilateral structure, the International Solar Alliance (ISA) that aims to promote solar energy in the 121 nations that are located between the Tropics of Cancer and Capricorn and that benefit from over 300 days of sun throughout the year. Through ISA, France and India had committed to promote over one terawatts of solar power generation, bringing electricity to hundreds of millions of families across some of the poorest nations in the world. Thus, when Trump decided to tear up the Paris Accord, Modi and Macron jointly promised their renewed commitment to the climate change treaty and the ISA and both the leaders also lent a sense of urgency to both the engagements. 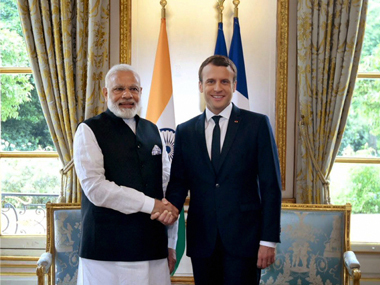 ‘I will be visiting India before the end of the year to attend a summit meeting of the ISA, not only to show our joint commitment to protect the climate but also share the innovations and technology of our (French) businesses and to give a new dynamism and a new foundation to furthering French relationship with India,” announced Macron after his luncheon meeting with Modi in Paris on Saturday. “The first part of our discussion was entirely focused on fighting climate change and the fact that both our nations have a lot to do, together, in protecting the global climate,” Macron added. Drawing parallel between terrorism and climate change, Modi added that while every child in France had seen and felt the horrible nature of terrorism, one of the biggest challenges facing the world today, the other big threat, in terms of climate change and pollution, is mainly invisible, but the one whose impact is being felt all over the world, just like terrorist attacks. “India and France would work together to protect the world from both these threats, which to us are equally important and strategic,” he said in his joint address with Macron. Modi also welcomed more French investments in this area. “We want to work with France in using technology to improve our transport, our urban development through smart, energy efficient cities and also for our energy needs. This will be the new energy in our bilateral relationship,” Modi said. Will data leak on Scorpene submarines torpedo Indo-French ties?